A recent report published by Infinium Global Research on energy storage systems market provides an in-depth analysis of segments and sub-segments in global as well as regional energy storage systems market. The study also highlights the impact of drivers, restraints and macro indicators on the global and regional energy storage systems market over the short term as well as long term. The report is a comprehensive presentation of trends, forecast and dollar values of global energy storage systems market. 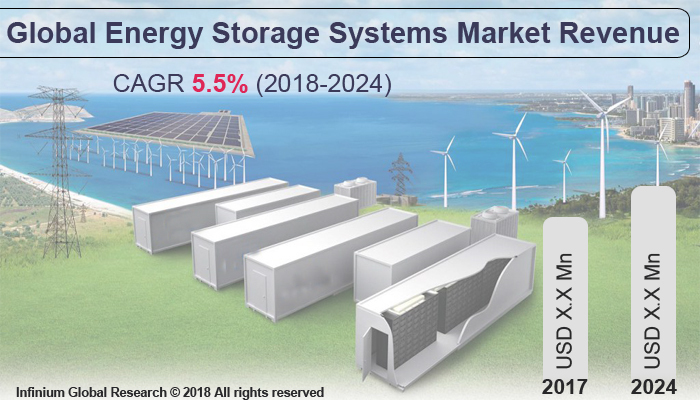 According to the report the global energy storage systems market is projected to grow at a CAGR of 5.5% over the forecast period of 2018-2024. The energy storage systems are associated with the storage of produced energy by using mechanical storage or electrochemical storage technologies for storing energy for later use. Renewable energy production is unpredictable as renewable energy sources are very unsteady. The energy storage system helps to provide an economical and conventional way to store the energy for further use. The adoption of renewable energy across the world is growing very rapidly that is driving the energy storage system market worldwide. The energy storage systems play a vital role in the storage of renewable energy storage. The energy storage systems come in the various capacities i.e. Ampere/Hrs. The rising consumer’s interest in the use of on-demand energy source is likely to boosts the growth of the energy storage system market. In addition, the use of the software’s to manage the energy storage system is expected to contribute to the growth of the energy storage system market. However, the initial high set-up cost of the energy storage system is expected to hamper the growth of the energy storage system. Moreover, the rising adoption of energy storage system across various industries is expected to create several opportunities for the energy storage system market in the upcoming market. Regionally, Asia Pacific region is the largest and fastest growing region in the energy storage system market owing to increased use of renewable energy sources such as solar energy and wind energy. Also, government regulation and incentives to use a renewable source of energy and increased the sales of electric vehicles in this region to facilitate growth in the Asia Pacific region. Moreover, China accounts for the major market share in term of production of batteries that is likely to drive the growth of the energy storage system market in this region. The report on global energy storage systems market covers segments such as technology and end-user. On the basis of technology the global energy storage systems market is categorized into mechanical storage, electrochemical storage, and thermal storage. On the basis of end-user the global energy storage systems market is categorized into residential, commercial, transportation and utility. The report provides profiles of the companies in the global energy storage systems market such as ABB, Siemens, Panasonic, LG Chem, Samsung SDI, General Electric, Hitachi, Tesla, General Electric Company, Maxwell Technologies, Inc., NEC Corporation and Others. The report provides deep insights on demand forecasts, market trends, and micro and macro indicators. In addition, this report provides insights into the factors that are driving and restraining the global energy storage systems market. Moreover, IGR-Growth Matrix analysis given in the report brings insight into the investment areas that existing or new market players can consider. The report provides insights into the market using analytical tools such as Porter's five forces analysis and DRO analysis of energy storage systems market. Moreover, the study highlights current market trends and provides forecast from 2018-2024. We also have highlighted future trends in the energy storage systems market that will impact the demand during the forecast period. Moreover, the competitive analysis given in each regional market brings insight into the market share of the leading players. This report will help manufacturers, suppliers, and distributors of the energy storage systems market to understand the present and future trends in this market and formulate their strategies accordingly.